Who says corn can’t be the star of the show? Side dish smide dish, treat corn with a little love, and it will love you right on back. Corn on the cob is already fabulous when it’s as simple as boiled, no salt, no vegan butter, nothing, just sweet delicious corn. But if you really want to wow your peeps, make some saucy goodness, sprinkle with pretty garishes, and all of a sudden everyone will be oohing an aahing like you are a genius! I adapted this cilantro and lime sauce from my recipe for Roasted Sweet Potato & Plantian Burritos. It’s such a yummy sauce, I had to bring attention to it again. I usually whip this up whenever I have a hinkering for some zing in my veggie life. For the corn, I just made it a bit thicker and richer with some nutritional yeast and I knew I found a match made in heaven. 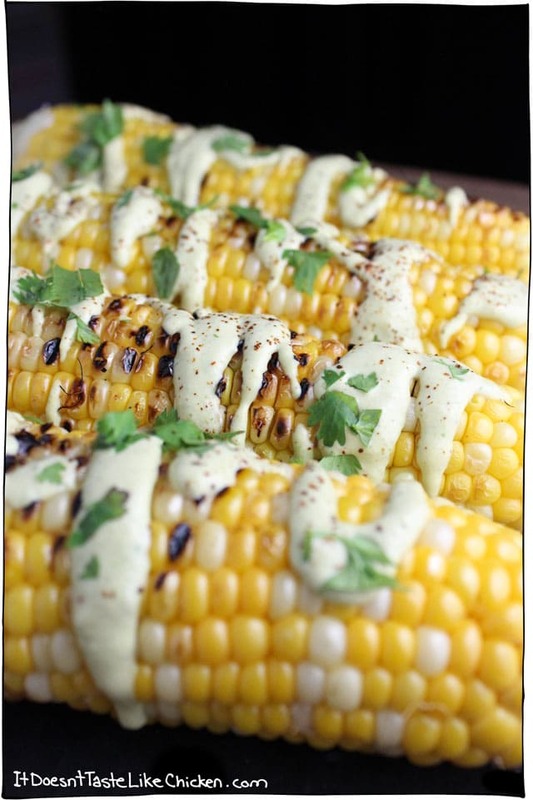 The sweet corn contrasted by the creamy and zesty sauce. Oh baby. You can make this sauce ahead of time and store it in an air-tight container in the fridge until your corn fantasies are ready to come true. Use any leftovers (ha!) to drizzle over salad, a baked potato, or anywhere else you think might be delicious (everywhere). If you are new to the vegan world, you will soon discover that raw cashews and nutritional yeast are two of our favourite things. This is totally true for this recipe too. The creaminess of this sauce comes from raw cashews! If you are not new to the vegan world, then you are probably already skipping past this part, and most likely have cashews soaking somewhere in your kitchen already. To make the sauce, just toss everything into a high speed blender. If your blender isn’t a Blendtec or a Vitamix, you may need to soak or boil the cashews first so they are easier to blend. You will end up with a super creamy, yummy, sauce. Yes please! For the corn, peel the husks off and discard. 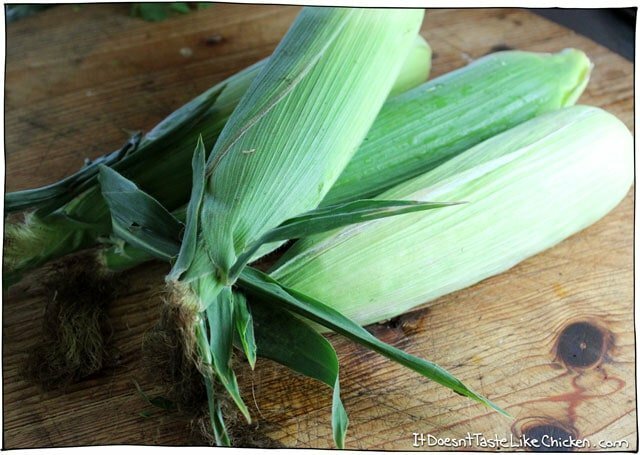 I recommend buying corn still in the husk because it helps trap in all of the delicious fresh corn flavours and protect the kernels from getting damaged. Now, just toss those babies on a hot grill, rotating as they are cooking until you see some char marks, and the corn has gone from a pale yellow to a richer, darker, yellow. If you prefer to boil your corn, follow the directions below. 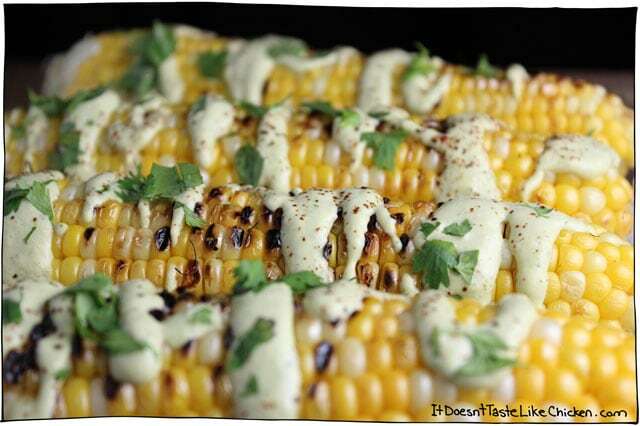 To dress, just drizzle the sauce across the corn. The messier, the prettier it looks! Sprinkle some roughly chopped cilantro over top, then follow with a couple pinches of chili powder. Voila! 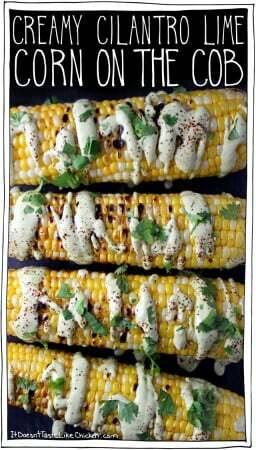 Gorgeous Creamy Cilantro Lime Corn on the Cob. This recipe takes only 20 minutes to make, but will wow your family or guests. The sauce is made from cashews so it is creamy and dairy free! Inspired by the sauce from my Roasted Sweet Potato & Plantain Burritos. 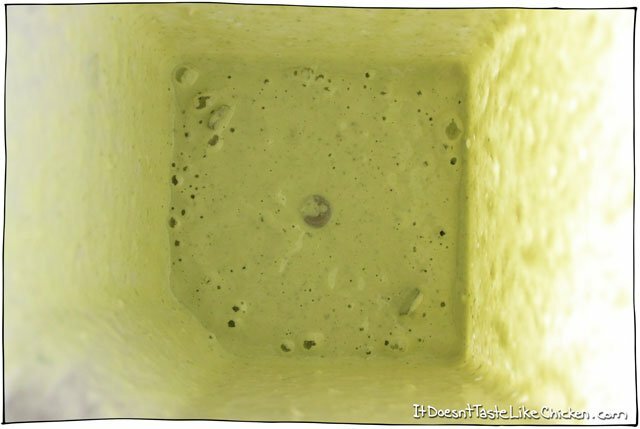 To make the sauce: Add everything to a high-speed blender, and blend until smooth and creamy. 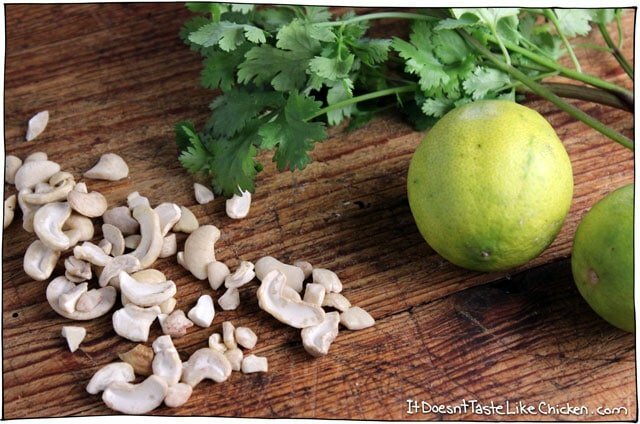 If you don't have a high-speed blender, soak cashews overnight or boil for 10 minutes until soft. Drain before using, and use ¼ Cup + 1 Tablespoon Water (instead of the full ½ cup of water). 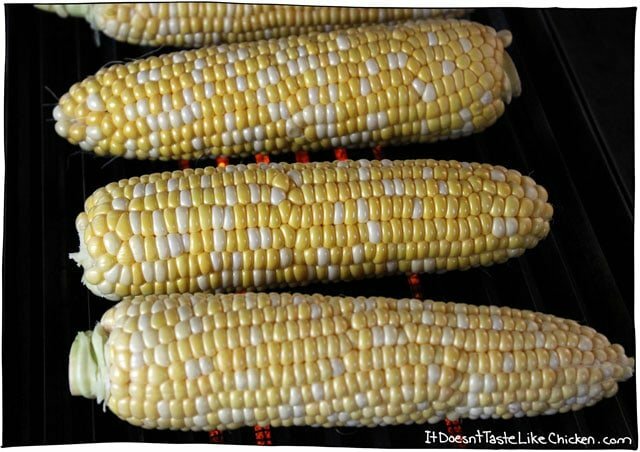 To grill the corn: place the corn on a hot grill and cook a couple minutes per side, rotating as needed. You want some char marks, and the corn will go from a pale yellow to a richer, darker, yellow. About 10 minutes. OR to boil the corn: Fill a pot that is large enough to hold all of your corn cobs with water, leaving room for the corn, and bring to a boil. When the water has reach a rolling boil, carefully put the corn cobs into the water, and boil for about 7 minutes until the corn has gone from a pale yellow, to darker yellow. Remove from water. 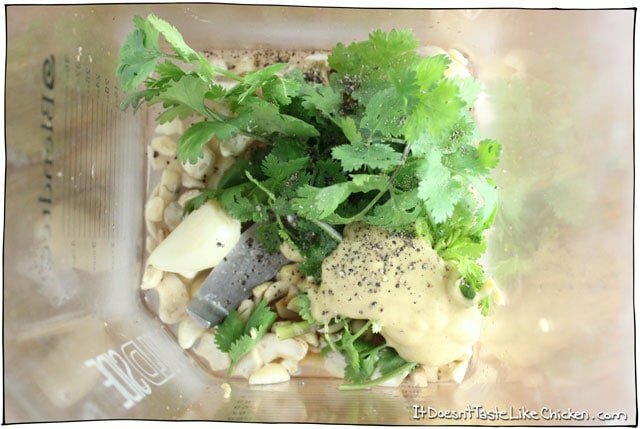 You can make the dressing ahead of time and store in an airtight container in the fridge. If you have leftovers, use on salad, a baked potato, or my Roasted Sweet Potato & Plantain Burritos. Is there a good substitute for cashews if you needed to be nut free? Hmmmmm…. you could try using a vegan mayo instead of the cashews and water. Hope that helps! I do not own a blender, but a food processor should be handle the cashews without soaking? I would still soak the cashews. The food processor wont get the cashews as smooth and creamy as a blender but it should still be yummy. Enjoy! This dish was deeeeeLISH! I loved the creamy cashew sauce. 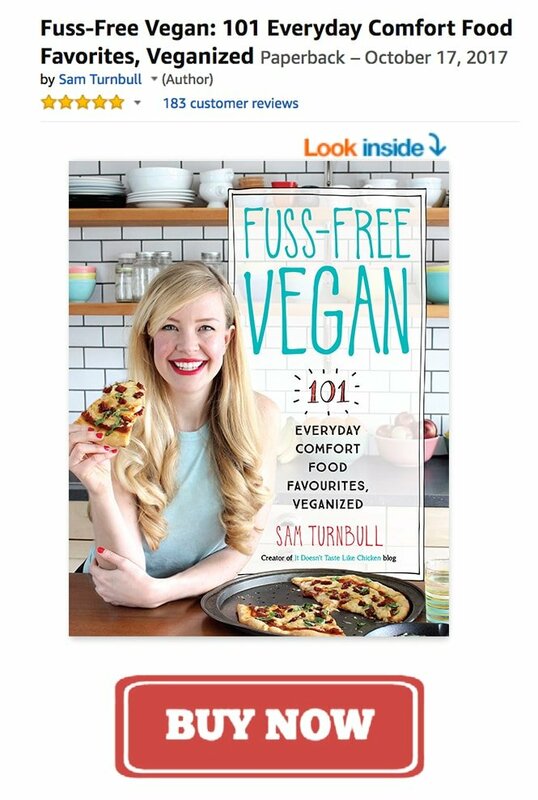 I even added this to my “Best Recipe Ideas for a Vegan BBQ” blog post! I wonder how this would taste if you added an avocado? I just made it and it taste pretty good. I was thinking about adding an avocado and some red pepper or hot sauce for some heat. If I do I will let you know. I just discovered your website and I love it. Hi there! 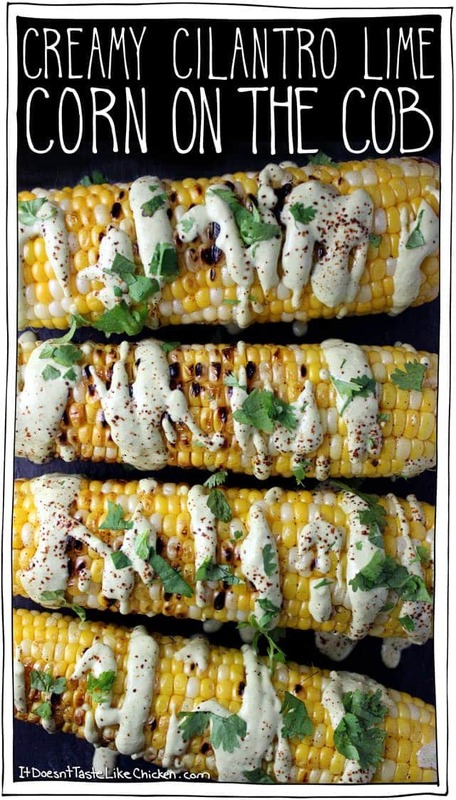 I just made this – it sounded great and I have had grilled corn on the cob with cilantro lime sauce before so I know what the real thing tastes like. I have to say that 1 tbsp of mustard is far too much by my palette. It was all we could taste – it just tasted like a mustard sauce. If I did this again, I would entirely omit the mustard and if the sauce “needed something” – add in 1/4 tsp increments. Thank you for the idea though! Can I leave out the nutritional yeast? What is a replacement for it? In this recipe, nutritional yeast thickens the sauce a bit as well as adds a cheesy flavour. I would recommend keeping it in if you can, if not try subbing with more cashews. Enjoy! This is so good! Thanks for the great recipe. My wife and I tried it this weekend and it will definitely be part of our regular rotation. Love your site. Keep up the good work! This is amazing! Thanks for sharing. I put in less garlic because I’m tired of all the garlic everyone seems to put in every vegan recipe. It was still delicious! Thank you! It’s pretty tasty for sure!! Awww thank you Meredith!! I love cashew dressings too. Omnomnom! Haha. Sweet now I have something to go with my enchiladas tonight! Oh yum!! That sounds like a great combo! !